Solar lamps. We see more and more of them, but not all of them are so pleasing to the eyes and functional as the Nomad Solar light designed by Alain Gilles. Solar lamps. We see more and more of them, but not all of them are so pleasing to the eyes and functional as the Nomad Solar light designed by Alain Gilles. The lamp that Gilles has designed is durable, flexible, and simple to use. It can be placed on the ground and sustain rough use thanks to a silicone disc that protects it from shocks and falls. With a built-in handle, it can become an overhead lamp, a spot lamp, or a lamp for those on the move. Made from ABS plastic, it is powered by 12 energy efficient LEDs, a 5-watt solar panel and li-on battery. It can also be charged using a standard adaptor or a cigarette lighter socket, and with an integrated socket, it can even charge a mobile phone. The lamp provides a safe alternative to kerosene lamps which have been known to cause serious accidents in developing countries. 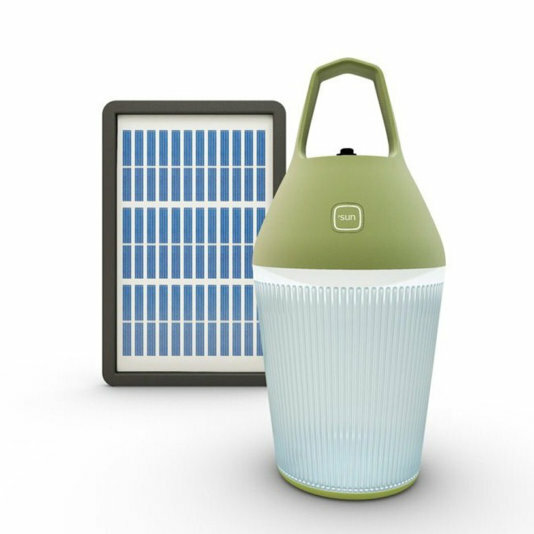 Once fully charged, the nomad lamp provides more than 6 hours of light at full intensity, fulfilling a range of practical uses after sun goes down. Commissioned by a company called o’ sun, the Nomad is expected to be manufactured in China or Africa where the lamps are needed the most. But still, no word on the pricing.